I don’t know if it is something that has been out into the global water supply recently, but swiping seems to be the new tapping. Why take the time to lift your finger up and decompress a button when you can feel manly and powerful enough by quickly swiping your finger across the screen to achieve the same result? I certainly know which one I prefer. One of the beautiful, and most important things about jailbreaking an iDevice is having the power and the freedom to modify and change the default behavior of Apple’s mobile operating system, iOS. Don’t get me wrong, a totally stock iOS is infinitely better than any of the competition in my personal opinion, but a user enhanced iOS with the right modifications totally blows its rivals away. Some users of jailbroken devices like to modify the operating system beyond recognition by changing icons, wallpapers and even fonts as well as behaviors, while others simply prefer subtle behavioral modifications to make things a little more efficient from a user experience point of view. There is no denying in certain areas that having the ability to perform a task with a swipe is a much more elegant solution than having to bash your way through various buttons or taps. The elegance of a swipe is one of the reasons tweaks such as Activator, Zephyr and SBSettings have been so popular. As Leonardo Da Vinci famously said, "Simplicity is the ultimate sophistication", and when you can bypass a long winded action with a simple user swipe, it isn’t hard to see why these gestures reign supreme. Developer Chris Kant has recognized this and with the release of his ‘Swipe Navigation For Music’, he has attempted to integrate the powerful user swipe gesture into the stock iOS Music application to flip through tracks from the Now Playing screen. The theory behind the tweak is that a simple swipe forward will move into the next available track in the playlist, with a backwards swipe playing the previous song. 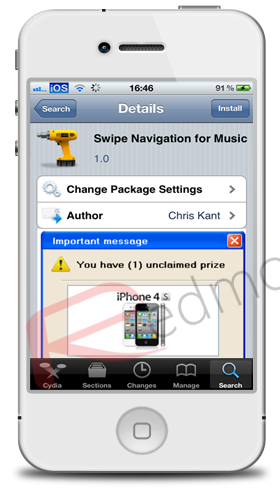 As standard, the Music application already has a ‘back’ swipe gesture built into it which takes the user back to the library of songs but the intention of Swipe Navigation For Music is to disable that default behavior and replace it with the tweak’s own rules. In theory, the Swipe Navigation tweak is a good one and whilst it doesn’t really provide any time-saving benefits, it is a handy little modification to have. After an initial hiccup with the submission of the tweak’s package which caused the first 1.0 version to fail, a new 1.0-2 version is now available which works perfectly. After installation, the Music application behavior is altered; allowing easy swipe navigation onto the next available song as well as replaying the previous tune. It may sound quite odd, but it is actually an extremely satisfying feeling to swipe the album artwork and watch the new artwork of the next song slide in elegantly from the side of the media player. While Swipe Navigation For Music isn’t going to be classed as an essential, must-have tweak; it certainly is an accomplished and very handy little mod to have. If you are interested, they are alternative options available if you want this functionality in your Music application? 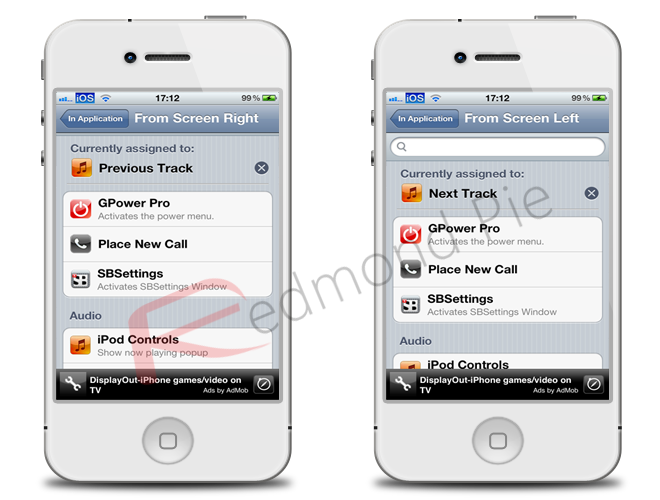 Activator is always a good second choice and can easily be configured to offer similar track changing controls. By going into the Activator options, I was able to replicate the behavior by selecting the ‘In Application‘ setting and then selecting the ‘Slide in Gesture’ options. By setting ‘From Screen Left‘ to next track, and ‘From Screen Right‘ to previous track, the behavior of Swipe Navigation For Music is effectively replicated. One thing that I do love about certain developers within the community is the swift response they provide to email support requests, and in the case of Christ Kant; this was certainly the case as he replied extremely quickly to inform me that version 1.0-2 had been pushed to resolve any issues I was having. As mentioned above, this is certainly not an essential tweak, but considering it is free of charge and extremely lightweight, it is definitely one worth trying out from the BigBoss repository.